The buckle is used to fix the pallet and the loads and to connect the two ends of the strap during the application of the strap. Buckles are also referred as wire buckles. The quality of the buckles is the most important factor affecting strength of the joint of the strap. The quality of the buckles depends on the diameter of the wire, the quality of the wire used, the quality of the surface coating and the form of the buckle. CO-STRAP buckles are mainly used with Polyester Corded Composite Strapping, Textile (hotmelt) Strapping and Woven Strapping but are also used with PET Strapping and PP Strapping. 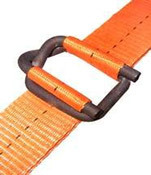 CO-STRAP Buckles, are produced in two different surface qualities: Phosphate coated and Galvanized Buckles. The quality of the buckle is one of the important parameters that determine the system strength of the strap. The most important factor affecting the system strength is the strength of the Joint. The System Strength of the Polyester Corded Composite Strapping is a very important parameter in terms of securing the package. As an example, for Composite strapping, its system strength should be more than 60% of its Linear Breaking Strength. 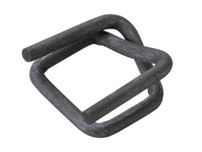 The wire used to produce wire buckle is phosphate coated and that is why they are referred as such. They are used with Co-Strap Polyester Corded Textile (hotmelt) strapping and Co-Strap Polyester Corded Woven strapping applications. Thanks to the roughness of the wire surface, they are more compatible with these types of straps. The wire used to produce Wire Buckle is Galvanized and that is why they are referred as Galvanized Buckles. Co-Strap Galvanized Buckles are used with Polyester Corded Composite Strapping and Polyester Corded Hotmelt (Textile) Strapping. They are also used with PET Strapping and PP Strapping applications. Although the System Strength of PET Strapping & buckle and PP Strapping & buckle combinations are not as strong as Composite Strapping & buckle combination, for light applications PET Strapping and PP Strapping are used manually with a Galvanized Buckle due to its ease of use.